The ink is barely dry on the new Sustainable Development Goals (SDGs), signed and launched in September 2015, and effective this month. They assert that “no one must be left behind”, but a newly commissioned piece of research launching today – “From rhetoric to action: Towards an enabling environment for child and youth development in the Sustainable Development Goals” – shows that many children and young people are being left behind – shut out of decision-making processes, unable to access their rights, and prevented from forging productive livelihoods. Case for Space is a global research and advocacy initiative to better understand and strengthen the environment for child and youth development. It is a project of three global youth organisations, Restless Development, War Child UK, Youth Business International and funded by the UK Department for International Development. To make matters worse, many movements of young people around the globe ― the very citizens who are best positioned to address these challenges ― find themselves caught up in the current global pushback against civil society. The sheer scale of challenging conditions can feel overwhelming. The Case for Space is more than a project title: it is a tragic necessity that we must continue to fight for an open, inclusive space for children and young people to live, learn, work, play and participate. What is the enabling environment (necessary conditions and structures) that ensures children and young people can influence decisions, have access to their rights, and have improved livelihoods? The three themes of participation, protection and livelihoods were chosen because they are critical areas of child and youth development, and can act as an entry point for understanding issues central to the lives of young people more broadly. The youth-led participatory approach is the centerpiece of this research, which enabled 18 young emerging researchers from around the world to take the lead in the design, delivery and analysis of research in their home locations across five regions. In designing this, we had two aims in mind: to conduct research and analysis that is firmly embedded in the vastly different political and economic realities of diverse young people, and to build the research capacity of emerging young researchers and leaders. We chose young researchers who were at the beginning of their careers who were not necessarily professional researchers, but who were deeply engaged with youth and civic life in their local contexts. In this way we attracted a range of talented young people who may otherwise not be traditionally engaged in youth research: young journalists, bloggers, activists, and community organisers. We wanted to build up the skills of those young researchers, to give them the capacities to be able to be their own strongest advocates in their local communities. Each of the Global Young Researchers is profiled online with their research rationale and main findings. In addition, each Global Young Researcher added a new media element to bring their research to life through film, photo, and audio. 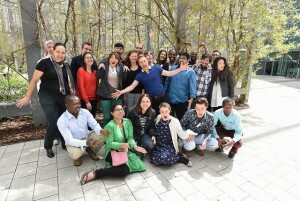 To give us a mix of global-level perspectives, a global survey of children and youth organisations was conducted to understand the environment in which they work and case studies were commissioned to provide insight into the day-to-day operations, programming and challenges of child and youth organisations across 11 different countries. The report presents key findings in the areas of participation, protection and livelihoods – as the original intended themes for the research – but goes further in outlining four cross-cutting themes: poverty, poor governance and a lack of effective rule of law, increasing restrictions civil society and closing of the political and civic spaces, and the resources needed for youth organisations and movements to survive. Not all of our findings are surprising: some important issues identified have been discussed for some time. The repeated and intensifying appearance of these issues therefore suggests that current actions are inadequate or absent. The findings of the research strengthen understanding of the major hindrances for child and youth development: disproportionate poverty; poor quality education; scarce employment opportunities; poor governance and a lack of effective rule of law; constrained political rights and freedoms; low trust in institutions; uneven civil society infrastructure; under-resourcing of many child and youth organisations and movements; and an increasingly restricted legal context for civil society. Around the world, small but important victories are being won by and for children and young people. Our research has showcased ways in which, on the cusp of a new era in global development, child and youth organisations and movements are taking action: young people are using online communication to form ad hoc networks to provide basic public services, respond to humanitarian crises and form community-based protection systems; they are establishing socially-oriented enterprises; they are advocating for policy dialogue on contested issues; they are holding leading roles in organisations and movements; they are taking to the streets, sometimes risking their lives, to push for justice and human rights. In the coming months, we will look at each of these themes, and their implications specifically for youth policies around the world. Until then, read the report (full or highlights version), or the executive summary, and explore the online version of the research, complete with full chapters from our Global Young Researchers, and their engaging multi-media projects. Cristina has a wide background in policy, with experience in government and non-governmental sectors, both in Canada and internationally. She has an MA Development Studies and MA Public Policy as part of the Erasmus Mundus Masters Program. Read more about Cristina on our team page.